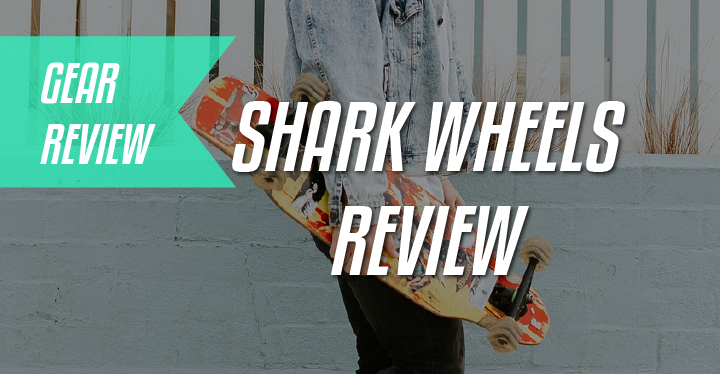 →Shark wheel review – A Gimmick or The Future? Shark wheel review – A Gimmick or The Future? A square looking wheel that is supposed to give you better performance? The hype’s real with shark wheels. Today we will go over what makes them stand out and whether or not you should really pay any attention to them. Are they part of a wheel revolution or just another gimmick to skate by? 1 Shark wheel review – A Gimmick or The Future? 1.2 Where Did The Shark Wheel Come From? 1.3 How do they work? 1.5 Downhill, Cruising and Rain skating? 1.8 So are they worth it? The sidewinder formula is built to be an all-rounder, general purpose wheel. The idea here is that you’ll have a smoother riding experience than having regular longboard wheels. If you ride around places, with varying pavement quality, you actually might find these useful. Though if you’re a serious rider and do a lot of free riding, sliding etc these won’t be the best option. The Mako formula is built for speed and easy sliding. Even though they’ve supposedly won some speed competitions, don’t expect them to be some kind of magic weapon. For best effect, you should get some fast bearings in them. Generally downhill and freeride wheels. Built for gripping tight corners at high speeds, which they do ok. However they won’t hold too long if you’re sliding them a lot. Smaller shark wheels for skateboards and mini cruisers. For street skateboarders, they won’t be like regular skateboard wheels, and it will be more difficult to land tricks as they won’t slide as well and you’ll have more wheel bites. That said, for smaller cruisers(i.e Penny Board) they’ll work just fine, – you’ll have slightly better cruising experience than regular soft wheels. Where Did The Shark Wheel Come From? Shark wheel is a company that has only recently been established. Having been founded in 2012 by a couple of California locals, Shark Wheel has opened its first skateboard shop in Los Angeles, with a warehouse. The company started out as an idea of revolutionizing the skateboard wheel design so it would offer superior performance advantages. In fact, they believe that the “Shark wheel” can be used in other applications and not just skateboarding. As it helps to roll faster and riding over uneven surfaces. 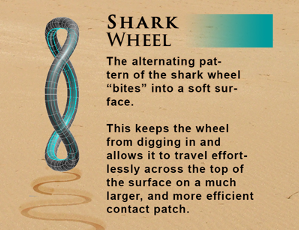 Instead of taking on a wheel shape, the Shark Wheels created a shape that is a three-dimensional sine wave. While being described as the world’s first “square wheel” due to its appearance, it is still actually round when it comes to the contact patch. Faster: The shape of the wheel allows for a narrow and smaller contact patch making them faster than traditional wheels. Due to less friction. Great grip and sliding control: Due to the sine wave design, the wheel has more lips than that of a standard wheel. It has three lips, compared to the usual one, on traditional wheels. Alternating patterns help the wheel have a greater grip and slide control. More traction on varying terrain: The sine wave pattern helps the wheels roll over debris like rocks and dirt. By “smoothly funnelling them aside”. Improved traction in rain and gravel: The alternating pattern act like grooves that help channel liquid from the surface of the wheel. This helps allow a firm contact patch with the ground..
Shark wheel offers a range of wheels to choose from, with lots of different colors. Diameters: Range from 60 to 70 mm. Providing an array of options. Wheels closer to 60 mm will accelerate faster, but have less top speed, and won’t roll over debris as well. Wheels closer to 70mm will roll over debris easier and provide faster top speeds. Durometers: Range from 78 to 80A. The lower the number, the softer the wheel is. Softer wheels will grip more on rough terrain, whereas harder wheels, will provide faster speeds, generally. There are a few formulas (types) such as “Mako”, “Sidewinder”, and “Ghost”. Downhill, Cruising and Rain skating? Whilst the wheels do perform well, they may not be the best option for downhill. As they may lack traction and grip. Compared to the more pronounced sharp lips on regular downhill wheels. Shark wheel also would need to provide bigger diameters and larger contact patches if they would want to take on downhill wheels such as the “Kegels”. Despite the appearances, the shark wheel really is still just shaped like a regular wheel, so when it comes to the faster speeds, there aren’t any obvious advantages. That said, someone on the “Silverfish forum” had conducted a test. Comparing the average speed of Rayne Greed wheels to that of Shark wheels. He noticed that Shark wheels did, in fact, made him faster as well as that they didn’t get nearly as hot as Rayne wheels after several heavy runs. (His test can be seen below) Still, there are many things that can contribute to this, so don’t take his test as a fact. The wheels slide well, breaking traction easily. However, it should be noted that sliding, like most wheels, wears the wheel down. This is more than true for the grooves in the shark wheel. Therefore the wheel may not be as durable as others. Despite this, the wheels slide adequately. Whilst also delivering control. Rain skating: The grooves on the wheels do appear to help aid skating in the rain, as it helps funnel out the water from underneath the wheels. This in turn, helps create grip. Here is a video from a user showcasing the wheels being used in the rain. Interesting and unique shape: The wheels have a unique look to them and it definitely sets it apart from other wheels. Therefore it can really make your board stand out due to the optical illusion of a “square” wheel. “Shark Wheel” also offers a wide range of different colours and combinations. Grooves: The grooves and lips on the wheels do seem to aid in cruising over rocks, stones and other debris. Whilst offering smooth sliding ability. The wheels also have a slight advantage when it comes to cruising. Travelling at slightly faster speeds to equivalent regular wheels. Additional traction: The wheels offer slightly better traction in wet conditions, compared to regular wheels. Price: The wheels are not overly expensive, and are priced competitively. “Shark wheel” could have taken advantage of skaters by overcharging and taking advantage of the hype. However it doesn’t seem to be the case here. The wheels can be also bought as a combo pack. Including a set of “Shark Wheels” and a set of either “Shiver ABEC-7” or “ABEC-9” bearings. Sliding: The grooves provide a predictable and controllable slide. 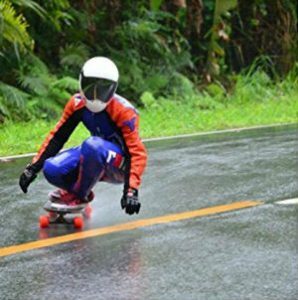 Carving: The wheels perform well when it comes to carving, particularly in the wet. Compared to most regular wheels. Good customer service: Whilst Shark wheels were being ridden out on the roads for the first time, due to the “Complexity of the moulds” some wheels had not been made correctly. Leading to some riders experiencing vibrations. However “Shark Wheels” were quick to send out “perfect” sets of longboard wheels out to unfortunate riders. “Shiver bearings”: The “Shiver” bearings included in the “Combo packs” come with built in spacers and speed rings. Making it easier to avoid losing components. Whilst the packs can be a bit pricey this provides additional value. They also come with “High performance lubricant”. If you choose to go with just a set of wheels, another good option for bearings is simply “Bones Reds”. Which will most likely be cheaper whilst also providing a good if not better roll speed. As “Shiver bearings are only ABEC-7 or 9 rated. Not really revolutionary: While the wheels do have a unique and strange shape, they don’t really outperform regular wheels. The small advantages are minuscule and when it comes down to it, the wheel is regularly shaped. Therefore any advantage could be easily negated by buying a different regular wheel. For example, if you wanted to buy something good for cruising, you could just buy a large regular wheel with a soft durometer. Rain traction: Whilst the wheels may offer some sort of additional traction, this can be easily overshadowed. As regular wheels can be simply given more grip by cutting grooves into wheels. Lack of downhill orientated wheels: There is lack of larger wheels, with larger contact patches and square lips. Therefore for those who want a wheel suitable for downhill skating, they are most likely not going to find “Shark Wheels suitable”. However there is a “Downhill” Shark wheel coming in the future. But for now choices are limited. If you are keen to try out a wheel that is a bit different, then it’s worth giving the Shark wheels a go. However when it comes down to it, the wheels don’t really offer any significant advantages that blow conventional wheels out of the water, particularly when it comes to downhill wheels. The most significant aspect is their appearance. 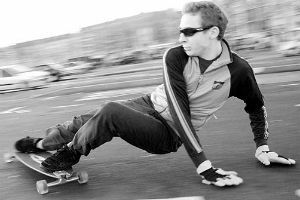 Nevertheless, they can still be a viable option for rain skating and cruising on rough patches of road. Where they may be slightly easier to ride, and speedier than their regular wheel counter parts.